Help pay for this website! You can add days to our subscription plan! 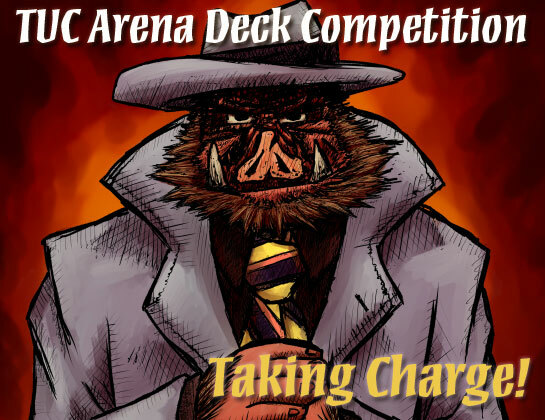 PvE Deckbuilding competition: Taking Charge! You are a top dog strategist, right? Do you know High Cleric Marzul? And the vile Therroz? Well they met on the battlefield. Came down right to a draw. So now they are nursing their hurtin' noggins and have issued a challenge: Whoever takes the best possible army into the Frost Ring Arena wins. Obviously the best possible army is the one that best. 20-0 certainly is best, but 15-0 ain't shabby either. It's all about percentages, man! And yes, if you got a good army composition order for me, I'll make it worth your while. Has to be the best you got, though! Oh, one other thing: The decks need to be charge-based. Don't know what they are getting high on, maybe they want to lick on it... You never tried that? Well, I can't really recommend it. Makes your tongue really go numb. Anyways - dem's da rules: You asssemble da electric armies, and if it's good, like really good, you get dem warez from me!